Despite offering one of the finest tourism snippets of incredible India, it's a pity, Odisha still remains vastly overshadowed in the tourist map of the subcontinent! Ancient monuments, pilgrimage sites, wildlife reserves, mangrove forests, hill stations, rivers, lakes, coastline - you name it, Odisha has been endowed with it. Like most other travel-obsessed Bengalis I have traveled Odisha more number of times than my lazy brain can recall. Yet, in every two-three years I get an irresistible urge to explore my neighbor state. In my last blog post on Konark Sun Temple I had tried to give an account of that traveler's idiosyncrasy. Visiting Udayagiri Caves was (probably for the fourth time) a tiny fragment of a bigger itinerary sketched back in December, 2015. 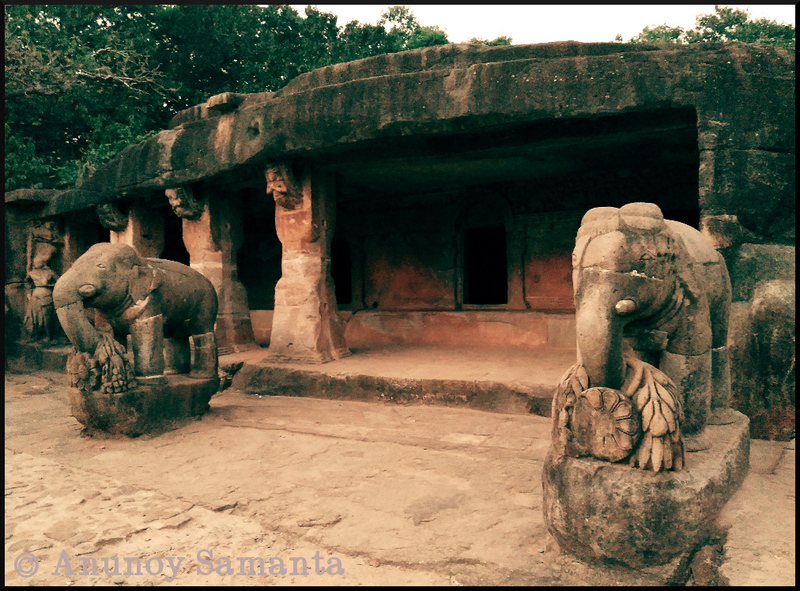 Ganesha Gumpha, one of the most significant caves of Udayagiri dates back to 1st century BC. Not everyday the teenager lobby boy at a busy motel in Bhubaneswar get to run errands for an unshaven solo traveler (more importantly, one who has arrived on a motorcycle). Probably the chap was looking for a trump which would work on me. Sunset was closing in. Although I had just arrived Bhubaneswar after a 450+ kilometers of ride, it seemed shallow to call it a day without even paying a courtesy visit to the nearby Jain caves- Udayagiri and Khandagiri. When the boy came to know of my intention he seconded my thought with a scheming smile, "Sir, as the sun is getting low you'll be rewarded with great views inside Udayagiri Caves". I was too tired to crack a conversation and simply smiled back with an optimistic nod. If you're absolutely free you might fantasize the truth concealed behind his 'great views'. There are altogether 18 caves in Udayagiri, most of which comprise a row of cells. The twin hills located in the outskirt of Bhubaneswar at a close proximity to NH-5, house excavated rock cut caves called Lena in the inscriptions, and were essentially dwelling retreats of Jain ascetics. There are altogether 18 caves in Udayagiri and 15 caves in Khandagiri Hill. These caves were excavated by Kharavela and his successors in 1st century BC. The activities continued till the time of Somavamsis of 10th-11th century AD. Most of the caves comprise a row of cells opening either directly to the verandah or to the open spaces in front. The cells were essentially dormitories, an inference substantiated by a sloping rise of the floor at rear end to serve he purpose of a pillow. Ah hold on! I didn't decode these architectural mysteries. It was plain and simple jotting down of information as provided by the Archaeological Survey of India. The Jain Temple perched atop Khandagiri Hill as visible from the top of Udayagiri Hill. In later periods some of the cells were converted into shrines with minor modifications, such as- increasing the height of the chamber by deepening the floor. The doorway of cells have pilasters on either side with crowning animal figures, and arches over them are decorated with flowers, creepers and animal motifs. Among all 18 caves at Udayagiri, Rani Gumpha and Swargapuri-Manchapuri Gumpha are double storeyed. The famous inscription of Kharavela is found engraved on the brows of the Hathi Gumpha, written in Brahmi script in 17 lines. It records many of his expeditions including the victory over Magadha and retrieval of the Jaina cult image taken over by the Nanda King. Udayagiri Caves as visible from the top of Khandagiri Hill. Ganesha Gumpha (Cave-10), one of the most significant caves of Udayagiri dates back to 1st century BC and contains two dwelling cells with a benched verandah in front. The arched doorway of he cells above the railings are relieved with scenes like the abduction scene reminding that of cave-1 and the other scenes representing the popular story of Udayana and Vasavadatta. The cave is named after an image of Ganesha carved inside. The historical significance of this cave lies on a five-lined inscription of 8th century AD. That afternoon I had kept my visit limited to Udayagiri Caves. Entry fee is charged for Udayagiri. There is a thick population of playful langurs on both of these hills. But, do not be too apprehensive of their presence. With time, they have learnt the art of existing harmoniously with hostile human beings. Modern Bhubaneswar city when viewed from the top of Udayagiri Hill. You need at least a couple of hours to explore the 'Sunrise Hill' (literal meaning of Udayagiri) properly. Due to imminent sunset I had to cut short my cave tour. By then, I had barely documented Udayagiri Caves, and Khandagiri Caves were left untouched. So, I had to return there the following day to wind up the unfinished trade. Both of my visits were on weekends and I tell you, the whole surrounding was messier than a crashed aircraft site! I am really sorry to say, the majority of tourists flocking there on weekends are far from being half civilized and I bet you won't dig their gross attitude towards such historical heritages. Unfortunately you can't change them. So, if you want to absorb the essence of those caves better schedule your visit on weekdays. The city of Bhubaneswar is a giant chest of monuments and history. I'll pick out another gem from that casket in my coming post. Till then, take good care. Wow! I loved the pics of the Udayagiri caves esp. the first one. In another pic with the elephants I see that the sculptor also sculpted leaves as if the elephants were feeding on them. This is the first time I have seen something like that. Elpehants generally don't look like they are eating in most sculptures. Strangely enough, only after you elaborated the scene I noticed those leaves! Good to see that you enjoyed your travel here in Khandagiri and Udayagiri. And I liked your photography of the same.